There is no doubt that the stretch of water in the heart of Bristol is a magical place to be. It is centre of All-Aboard’s community of like minded people who offer their help and support, to break down the barriers that may be perceived to participation in watersports, enabling everyone access to these brilliant activities. Being a volunteer with All-Aboard is a fantastic experience. Our volunteers are a core part of what makes our organisation the success that it is; we could not function without them. From welcoming visitors to the centre, to helping to rig and maintain boats, to taking disabled users out onto the water; volunteering with us is rewarding and great fun, whilst also being a great opportunity to improve or learn new skills. When we receive your application we will invite you down to meet us and join in a session which interests you. We will ask you to provide us with a couple of referees and to fill in a DBS form. Once we have had a chat with you and worked out what you would like to gain from volunteering with us we will “buddy” you up with another volunteer for a trial session and start you on some training. We will ask you to log your volunteer hours whenever you attend and offer you the opportunity to take part in our Volunteer Reward Scheme. This allows you to be rewarded for your volunteering with us by an opportunity to attend one of our in-house training courses or session run by All-Aboard Watersports. Examples of courses can be found by clicking here. Click here and here to read some of our volunteers experience’s of volunteering at All-Aboard! To learn more about All-Aboard read pages 1 & 2 of the Bristol Evening Post Article. As part of our free in-house training for volunteers and instructors, please find below our dates for this season. Please contact the Volunteer Coordinator if you’d like to attend any of these sessions and we’ll update it in to TeamUp. As part of National Volunteers Week 2018, we celebrated one of our volunteers each day as a way to showcase just a slice of some of the incredible work that they do to support us. Q What do you help out with at AAW? 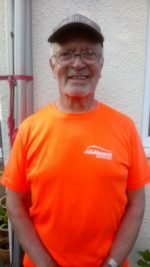 I take the Thursday morning over 50s rowing, help out with other rowing and sailing sessions when needed, and spend Tuesdays in the shed maintaining and repairing All-Aboard’s boats. Q What was your motivation for volunteering for AAW? I do it because I enjoy being out on the water and around boats, and All-Aboard is a great way of helping others from all backgrounds and abilities share that enjoyment. Q What three words you would use to sum up volunteering with AAW? I am a water activity volunteer. I retired from full-time employment and hadn’t planned what to do afterwards. I came to CSAF at the recommendation of a friend and thoroughly enjoyed myself. I saw volunteers were needed and put myself forward and was accepted. No stopping me. I found that not only did I enjoy MYSELF volunteering with able/disabled children and adults but saw how much THEY enjoyed what we did together. They learn from us as much as we learn from them. Plus enjoyment all round. All-Aboard get people out on the water in all weathers to learn many skills with which they can move on to new qualifications in the future if they want to. From building boats and sheds or designing new storage for the instructor station, designing and building boat storage. 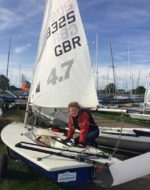 Standardising the build of a fleet of optimist dinghies. Being bullied in to it by friends. When I retired I had a bit more spare time and been doing charity for 40 odd years. If I don’t have a project I get twitchy so like having things to do. Something that’s problematical I like solving. Started working with my hands again, after flying a desk for 30 odd years flying a desk was nice to get back on the tools but as a qualified electrician I refuse to use electrics. 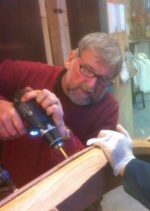 After running my own business for over 40 odd years that’s why I love the woodwork. Three words just isn’t enough! Multi-faceted, love the charitable aspect of it, most of the people that are working here don’t get paid, it’s a ‘proper’ charity. I’m a volunteer Sailing Instructor for After School Club. Personally, to get out and meet new people who I wouldn’t usually have a chance to get to know. I like to think that I’ve helped more children to have a chance to try sailing and hopefully inspire the next generation. Volunteers with AAW are always inclusive, friendly and enthusiastic. I volunteer on the Sailability sessions. Having worked in education I wanted to continue that contact with people and I love the water. Watersports gives a new confidence and positivity to our clients and volunteers alike. I love the teamwork and am always learning new skills. 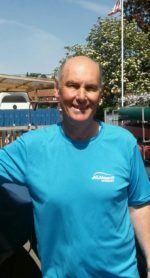 I am an Activity Volunteer and a Sailability Assistant. I was lured into All-Aboard by my good friend and now ex instructor Ernie Wise. A few years ago he invited me to try an over 55 taster course in sailing, it cost me £3 for three hours which I thought was a wonderful experience. When I came off the water I was asked are you coming back next week, so I thought wow this is good. After a few weeks I was given a R.Y.A. level 3 sailing certificate. 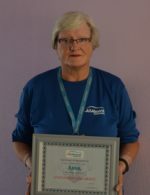 Everything about the centre impressed me and I thought ‘how can I keep this going?’, so I offered to volunteer and was duly accepted but not only accepted, I was given so much training P.B.2 , Health and safety, First Aid, Disability Awareness and so much more. My time at All-Aboard has truly been an awesome experience and I enjoy helping others to find the same level of enjoyment. 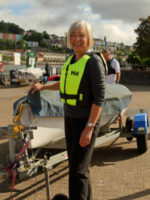 I help out by volunteering as a Dinghy Instructor on after school clubs on a Wednesday, and have done so before as an Assistant Instructor, I also sometimes help out with holiday club or on weekends. I sort of fell into volunteering, as I kept coming sailing after passing all the youth stages, and ended up helping with the sessions as there was little they could teach me while also instructing beginners. I now enjoy volunteering as it’s really rewarding seeing kids find confidence in themselves and learn a new skill, something I gained from AAW when I learned to sail here. In a way it’s passing on that experience, the joy of sailing and the experience of having a new and quite rare skill.